Ax – Bill Eadie & Smash – Barry Darsow, are the duo behind the legendary professional wrestling tag team DEMOLITION that dominated the WWF in the late 1980s and early 1990s. Clad in black leather and spikes, Ax and Smash steamrolled into WWE from Parts Unknown and made it painfully clear that they were going to demolish any team that stood in their path. In the ring, they removed their black monster movie masks to reveal painted faces that intimidated opponents before the match even started. 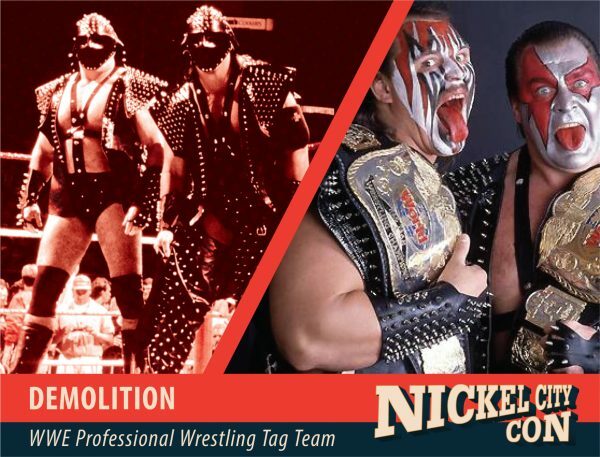 Demolition have an impressive amount of achievements behind them, in the WWF, Demolition were three-time WWF World Tag Team Champions, & hold the record for the most combined days as reigning champions. Their first reign with the WWF World Tag Team Championship is the 2nd longest reign with any tag team championship in WWE history & is the longest reign on record for that championship. The path of destruction Demolition carved through WWE would never be forgotten. No team has come close to causing the devastation that the original Demolition duo, Ax and Smash left in their wake.